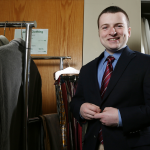 SUITABLE SERVICE—Missouri University of Science & Technology has a closet packed with men’s and women’s suits and accessories available for free rental. Staff can serve as stylists. Career center services professionals face increased student expectations today—often beginning at the admissions stage as families ask about internship and job-search supports. Those demands extend in many cases to alumni, who now turn to their alma maters in career SOS situations. Career centers are in many cases meeting expectations for student career development—yet students as a whole, still focus more on the job search itself than on acquiring job-success skills, and a significant portion of students never even seek out services. Raising awareness of traditional and newer services, which thanks to technology can often be delivered remotely, is essential. Career centers are proving, too, that they can create innovative programming to entice participation. Following are 21 ideas worth adopting. 1. Offer for-credit career courses. In North Carolina, Wake Forest University students have four 1.5-credit, half-semester courses to choose from through the Office of Personal & Career Development. The courses offer hands-on experiences, personal discovery, and professional and life tool development to guide students from college to career. 2. Start or expand on an interview-suit closet. About 500 students utilize the suit closet each year at Missouri University of Science & Technology. What started as a simple coat rack has become a room packed with men’s and women’s suits and accessories. Unlike at many institutions, interview suit rentals are free. And staff can assist with taking measurements and finding a tailor, and offer tips on putting a best foot forward. 3. Broaden counseling beyond careers. Career counselors at Howard Community College in Maryland are trained to assist with both career and personal counseling. After all, the right appearance won’t mean much in an interview or on the job if someone is struggling in other areas of life. And having the same counselors helps manage the stigma attached to seeking mental health care. 4. Help connect students to paid, career-relevant work experiences. The University of Indianapolis has worked to establish such opportunities through industry partnerships. For example, the Roche Academy, developed with Roche Diagnostics, offers a paid summer internship, financial and educational incentives, and a job offer from Roche upon graduation. 5. Plan big-city career treks. Wake Forest gets students out in the world via Career Treks to various cities. Participants of the multiday trips engage with industry professionals, expanding their networks and increasing awareness of career choices and competition. Grants and stipends are available to students with financial need. Whether the option is available regularly or only for set hours or days, career centers can offer snacks and the chance to casually chat with career counselors. Plan on attending first-year orientation sessions to introduce students to the career center and its services, including campus employment if it’s handled through the same office. Video-based meetings can be just as productive as in-person ones, especially if students have a list of items to prep or submit in advance. 9. Make wait times productive. Career content need not be hidden behind closed doors. Consider playing such content (created for the department if possible) on displays for students waiting for an appointment. 10. Allow counselors to “own” academic areas. With assignments to cover specific disciplines, career counselors will naturally form bonds with faculty and students in those programs, as well as with industry leaders. 11. Allow the outside community in. Community colleges in particular may offer community members free career counseling and access to job fairs hosted by the institution. Counselors benefit, too, by becoming more educated about careers throughout student life spans. In video debriefings, advisors can help students pinpoint missteps—from closed body language to forgetting to turn off cell phones or ineffective interview responses—and then guide them for interview situations. From creating a selfie spot at a career fair to requesting a post after an internship experience, spreading the word online boosts awareness of career center efforts. 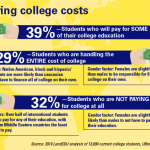 Whether it’s a competitive process to get assistance or (even better) the college can offer a funding guarantee, students are more likely to pursue work-for-credit experiences without money worries. 15. Partner with other groups on campus to plan events. For big or small events, a campus co-host may offer logistical or content assistance, a promo boost, and/or event space. Don’t overlook partners as professors as partners. 16. Offer career boot camps. Some students will be more likely to access career services through an intense one-time commitment, such as a full day or multiday event featuring workshops. 17. Organize a speed-networking event. Tapping industry leaders, advisory board members and alumni, such an event can help students hone their “elevator pitch.” Between rounds, the listener can provide feedback on the exchange. 18. Run a virtual job fair. Besides student convenience, such an event allows employer reps to avoid travel time and expense. A fair may be geared toward a specific audience, such as veterans, graduate students or students studying abroad. 19. Try a reverse job fair. The night before an on-campus job fair, allow student organizations to set up tables for employers to visit. Perhaps they have an interest in recruiting students in a particular honor society or those who participate in a specific activity. Student check-ins at workshops, career fairs and even advising sessions offer useful data for career center administrators. Professors can work with the center to require or offer credit for attendance. Students attending a certain number of events or completing activities, such as a career assessment, could win a prize. Melissa Ezarik is UB’s senior managing editor.